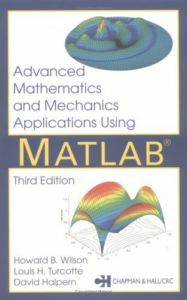 Advanced Mathematics and Mechanics Applications Using MATLAB, Third Edition features extensive revisions that bring this bestselling text thoroughly up to date with MATLAB 6.x, especially with its graphics and animation capabilities. It incorporates new material on time-dependent solutions of linear partial differential equations, a new chapter on eigenvalue problems, and more than 300 pages of MATLAB solutions to important applications. The authors provide an abundance of new physical examples related to heat conduction, inviscid fluid flow, geometrical properties, stress analysis, and multi-dimensional optimizations. The source code for all of the programs presented is freely available for download from the CRC Web site.